Children, adolescent, and adults with prehypertension have a high risk for developing hypertension. 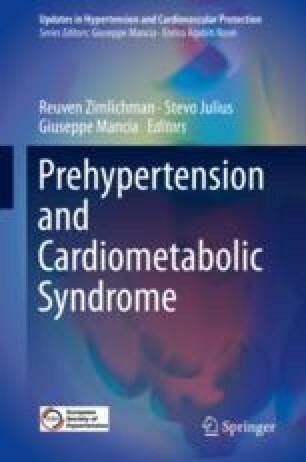 Modifiable cardiovascular risk factors, such as prediabetes and diabetes mellitus, overweight and obesity, high lipid diet, high salt intake, and lack of regular physical activity play a crucial role in the transition between prehypertension and hypertension. Because these cardiovascular risk factors are key determinants of increased arterial stiffness, and because increased arterial stiffness is a determinant of incident hypertension, the question arises as to whether arterial stiffness plays a crucial role in the transition between early phases of prehypertension and hypertension. In this review, we will analyze the epidemiological and hemodynamic evidences that increased arterial stiffness is a determinant of incident hypertension. We will also address the complexity of this relationship by discussing the hemodynamic and biomechanical pathways involved in the bidirectional influence between arterial stiffness and blood pressure. And then, we will discuss (a) the predictive value of arterial stiffness not only for incident hypertension, but also for cardiovascular events, (b) the influence of low-grade inflammation associated with chronic diseases in the development of arterial stiffness and subsequently hypertension, (c) how the concept of Early Vascular Ageing can help understanding the relationship between arterial stiffness and prehypertension, and (d) the relationships between metabolic syndrome, arterial stiffness, and prehypertension in children.